The SEI Mini-Berm is a lightweight solution for spill containment. Resistant to fuels, oils and most chemicals, including acids. Entirely reusable and compact as it is a collapsible solution. Optionally you can attach a drain fitting. Optional berm handles can be attached as well. Mainly used for containment of waste water, petroleum products and various other chemicals. 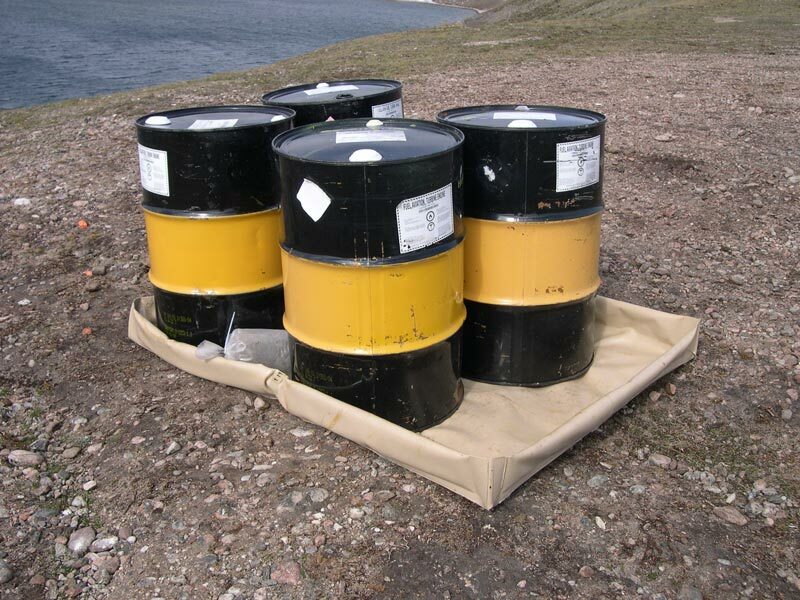 For storage of toxic materials. The SEI Mini-Berm is an ultra lightweight solution for clean-up operations and spill containment. It's mainly used during fuel and chemical transfers. A Mini-Berm tray is extremely easy to place under valves and fittings, trucks, pumps and machinery. The Mini-Berm is a convenient solution and is entirely reusable as well. It's made out of Artic-Shield fabric which can withstand temperatures as low as -50 F / - 46 C. The fabric is resistant to most chemicals as well. It's a compact solution that is available in different sizes. It's designed to take standard-sized sorbent pads and it helps to avoid penaliteies from non-compliance to EPA standers.